The wonderfully creative Elizabeth from her kitchen in Shetland is hosting this month’s We Should Cocoa and she has tasked us with making bite sized chocolates. Flavours are completely up to us. As it happened I’d been given some chocolate flower moulds with sticks as a birthday present from my mother and this seemed the perfect opportunity to try them out and make one of my favourites, almond chocolates. I have found tempering small amounts of chocolate to be well nigh impossible. I am, however, always willing to keep trying to achieve that elusive Beta 5. Salted caramel continues to be my flavour of the moment, so that’s what I opted for, using some fleur de sel from Brittany. First I made some salted caramelised flaked almonds and then I used them to make salted caramelised almond chocolates. The idea was to make them in the shape of flowers with dark chocolate leaves and a white chocolate centre. I ended up with some some chocolate and nuts left over, so I made a few spoons as well. Why not? I was hoping the salted caramelised almond chocolates would have a pretty white centre to them, but the dark chocolate covered most of the white chocolate buttons. This technique obviously had a few flaws. Next time, I will have to try melting some white chocolate into the bottom before adding the dark, though I’m not sure that would achieve the neat result I was looking for either. Beta 5 may have eluded me once again, but I felt I wasn’t far off – with the spoons at least. Despite the chocolate flowers not looking quite as good as I’d hoped, I was still really pleased with them. They looked fun all stacked together in a vase and they tasted fantastic. These salted caramelised almond chocolates had a rich, strong flavour with a salty, nutty, crunchy heart. Eating them on sticks allowed the chocolates to be nibbled and savoured without getting a melted mess all over our hands. Whether you make them as flowers, spoons or something else entirely, these would make a wonderful gift. Sweet and salty, melting and crunchy, these almond chocolate are pure delight. Flower shapes are entirely optional. Dry fry the almonds with the icing sugar and salt over a medium heat stirring all the while. After about 8 minutes, the sugar should have caramelised and the almonds turned golden. Remove from the heat and allow to cool, then roughly crush. Melt 60g of the chocolate over a pan of hot, but not boiling water, making sure the water doesn't touch the bowl. As soon as the chocolate had melted, remove from the heat and add the remaining 15g. Stir until melted. If making the flowers, lay a white chocolate button at the bottom of the flower moulds. Insert the sticks and top with a teaspoon of melted chocolate. Add some of the crushed caramelised nuts. Top with another teaspoon or so of melted chocolate until they are full. Bang the moulds on the surface to disperse any air bubbles and spread the chocolate into the corners. I made six flowers and used the remaining chocolate and some of the caramelised nuts to make three chocolate spoons. I think they still look pretty even without a perfect white centre to them, look even good in the vase. I am liking the spoons too. I don’t know If i’ll be able to participate this month, but am already looking forward to the other contributions. Thank you Shaheen. Would of course love it if you did manage to make something, but I know how difficult it is to find the time. Those almonds have me drooling! The combination of salty caramelised almonds and dark chocolate is divine. I’ve never tried tempering chocolate (don’t know why) but it looks to me like you did a really good job with the spoons, they have a professional looking gloss to them. The chocolate flowers also look really pretty in the vase, am going to have to add one of those moulds to my collection when I get chance. Yes it’s a rather splendid combination. Thanks Rachel. Those chocolate flowers look pretty great to me. oh my gawd they look so adorable and so professional too!… as you well know we both have a love for anything salted caramel so these are quite literally worth travelling down to see you for and make you sweat over a hot stove to make another batch, which i’m sure you won’t argue to do… so get the pans out! Oh don’t stress about it Johanna, it’s actually quite hard to do. Tempered or not, homemade chocolates are a delight. Thank you for your generous comment – as always. Trying to get into salted caramel? Does this mean you don’t like it? I love these moulds – so pretty. You could try adding the white chocolate buttons after removing from the mould. They would only need a small drop of chocolate to fix them and would give nice definition. Oh my goodness gracious me these look divine and sound oh-so-tasty! I had my first experience with salted caramel recently on a trip to Unst (the most northerly inhabited island in Britain). There’s a big red double decker bus there by the ferry terminal that sells locally made salted caramel ice cream, and oh my, I fell in love! These are a perfect entry to this month’s We Should Cocoa challenge, thank you for sharing! These sound incredibly delicious! I love the flower molds, do you know where they’re from? I want them! Chocolate is very finickety re. Tempering. Melt it then add more as you have but keep adding until it does melt anymore into it. Fish out the lumps of unmelted & you’re basically there. Thanks very much Martin. I will try and remember that for next time. My problem with fishing out the lumps is – what do you do with them? I love salted caramel so please send some over! 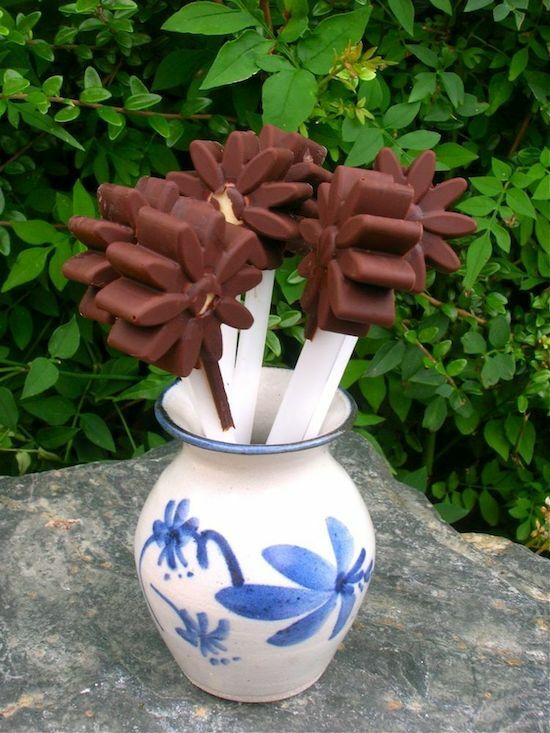 The flower moulds look great – I love the the idea of chocolate on sticks – definitely less mess that way. I bought the spoon mould ages ago but have not gotten round to trying them out yet. Do try your spoon moulds, you’ll love them. It needs to melt to about 45c then cool to 32c the allow the magic beta5 time to form; the added Choc is just a good source of beta5 to encourage more to grow. I can temper as little as 100g in around 10mins this way. I also use a microwave to melt it (15sec bursts). Bet those lollies tasted good! Those are my kind of flowers Choclette! 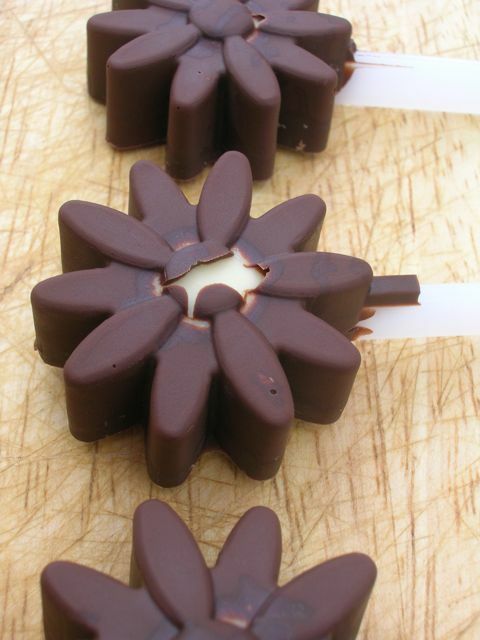 I’ve never seen flower chocolate moulds before but what a lovely gift fom you Mum, they look fab! Love the flowers – I would like to be given a bouquet of them! Those almonds would be lovely on top of chocolate ice cream or a tart. ph my…these are so cute and such a wonderful post!! cant wait to try with my kid! Fun flowers! Keep trying at the tempering, it’s magical when it works. Even when it doesn’t, it’s always delicious! Ohhh I love salted caramel !You must have such patience and steady hands Choclette!